From near Caldons a footpath leads through the wood to the grave enclosure. Within this is a replica stone in granite - the original having been broken. It is now located in Newton Stewart Museum. On the wall of the enclosure is a second inscribed stone, shown to the right. A group of Covenanters were holding a prayer meeting at Caldons, at the foot of Loch Trool, on 23 January 1685. They were surprised by Colonel James Douglas, Lieutenant Livingstone and Cornet James DOuglas. 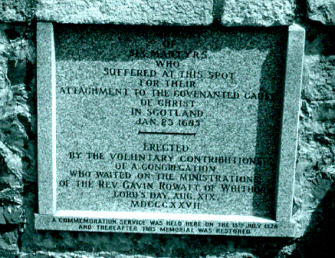 Six Covenanter were killed as they tried to escape. 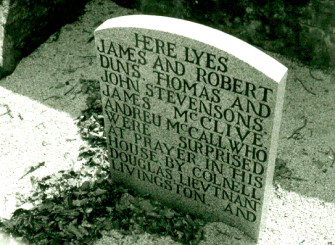 The Covenanters fought back, and two of the soldiers were killed, including Captain Urquhart.